Q. How fast can we get our data and will you retrieve the data for us? A. Hansen Records Management offers rush delivery service within two hours Monday through Friday from 9 AM to 5 PM. Emergency service is available after hours. Standard delivery requests will be delivered the next business day. 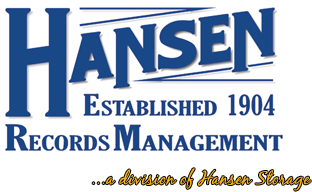 Hansen Storage can also scan and e-mail or fax files if you choose.